Hey, did I mention that my buddy Jim Shepard has finally finished his epic, Dungeonmans, and it is fully purchasable on Steam? He’s done such an amazing job… I spent a few weeks helping out a little on traps when I was awaiting a move to San Francisco back in 2010, and it was the very thing that made me realize how much I had missed game coding. I can’t lay any claim at all to the final product because probably 1% of the code I wrote back then made it into the final product, but it was a meaningful moment to me nonetheless. Back in November, Jim and his long-distance contributors/friends decided to gather in Seattle for a week-long push to get Dungeonmans that much closer to the finish line. I put in a day or two (as a designer this time) and helped create a couple of “master dungeons”, and it was amazing to see how much the game had improved over time. From the early days… …to release! 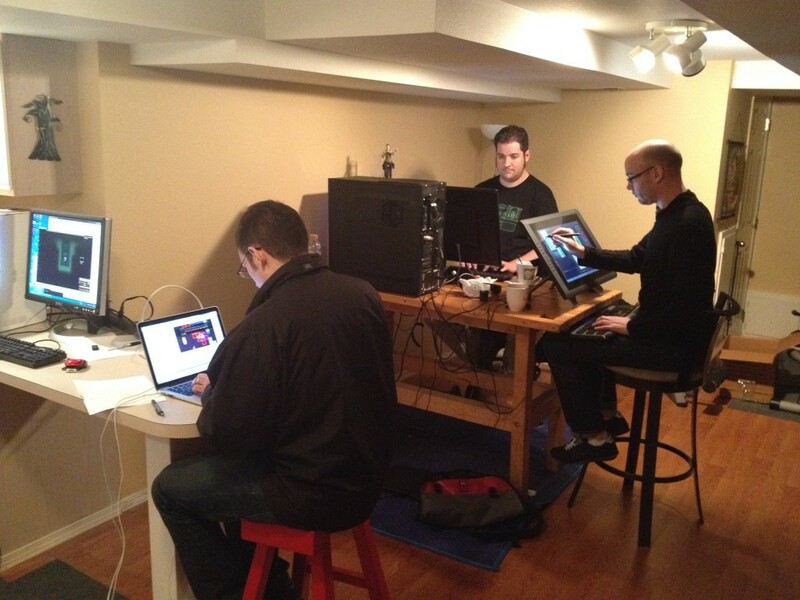 The coolest part was having an honest-to-god game studio, Adventurepro, in my basement for a week! These are amazing guys, each with years and years of grizzled veteranmancy (a word I just crafted now) behind them… They deserve every new success. I’ve had to take a break on the article-writing to immerse myself in my work. Theory is fun, speccing can be rewarding, and hooking up is good, but sometimes I’ve found myself missing real hands-on gameplay programming. A friend of mine has been creating a Rogue-alike as a side-project labor of love for the past few years, and recently it went from sporadic updates to a full-on development flurry. This of course made me very jealous, as tile-based engines allow for amazing freedom in creation… There are few limits and implentation is a breeze. It’s all about the gameplay. The game is Dungeonmans, and he releases updates openly as an in-progress effort… It obviously revels in its old-school presentation… although the graphics are getting better by the day. He’s created an overworld and NPC quest system as well as invested a great sense of humor within, so in some ways it outpaces similar indie dungeon-crawlers already. It even can gather play stats that get collected at the home base for analysis and high scores. Recently he made the codebase available to a few of us, and we’ve all been diving in and having a blast. 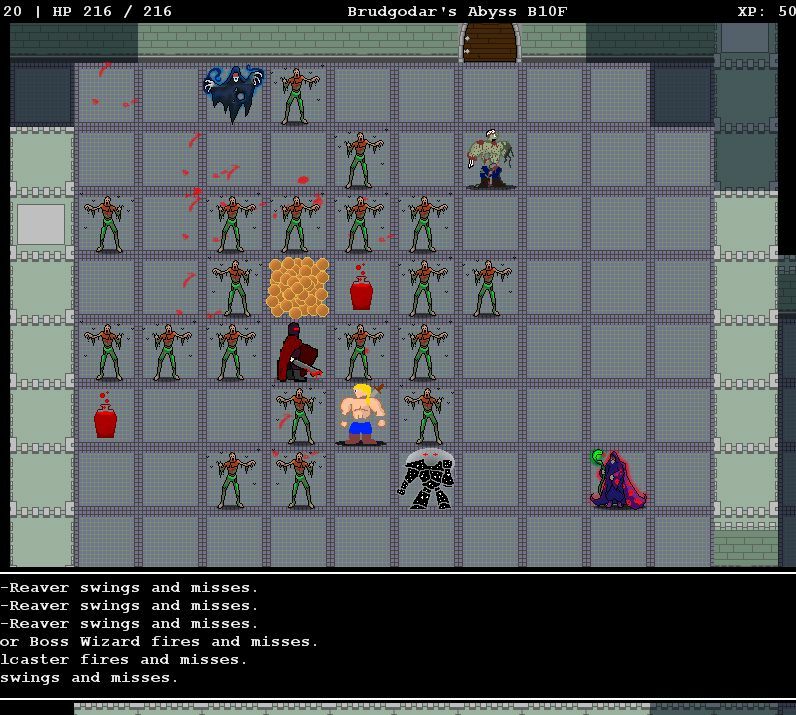 I’ve been working on a trap system recently, and I gotta say it’s the most fun I’ve had with development since Heretic II. It’s been a while since I’ve worked on something past midnight without even noticing. It’s not Diablo III, but fun doesn’t have to be developed in 3D by hundreds of people… Check it out.